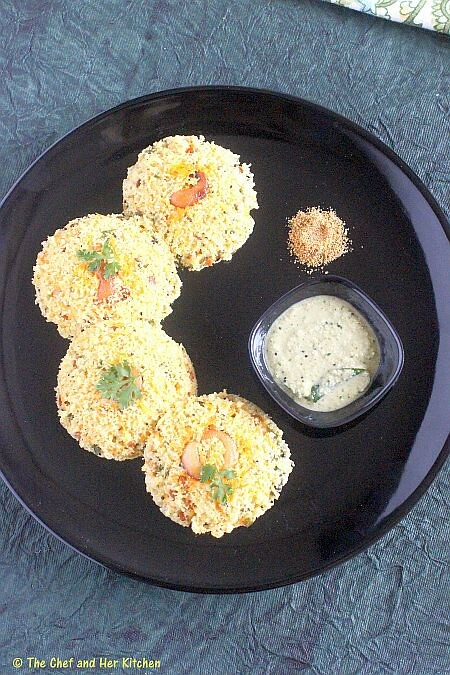 As I have mentioned earlier in my blog, Oats can be easily adapted in South Indian breakfast varieties.Most of my oats recipes like Oats uthappam,Dahi Oats, Oats pongal, Oats Bisibelebath, Oats Kharabath, Instant oats dosa, Oats & Nuts Ladoo are popular among my readers hence I am adding one more recipe to my Oats recipe gallery to give more healthy options to the readers. I am a huge fan of Rava Idli that we get in Bangalore,especially in Adigas.It is extremely soft and very porous where in each bite you can see the fine texture of individual rava granules and is very flavorful as it is loaded with lots of fresh coriander leaves.I follow the same recipe of rava idli for my oats idli just that I replace half the quantity of rava with powdered oats,one can increase the oats quantity in the recipe but I like the texture of Idli better when it is prepared with equal quantities of rava and oats. Heat ghee in a small pan and fry slit cashew nuts until light golden in color.Keep them aside. In a kadai/pan slightly roast oats and once it is cooled down grind them to a coarse powder. Heat oil in the same kadai/pan and crackle mustard seeds and cumin seeds. Add chana dal, cashew nuts and fry until its light red in color. Now add finely chopped ginger and green chillies and fry until they turn slightly crisp and then add chopped curry leaves. Add rava and fry until you get a nice aroma,then add powdered oats and give a gentle stir.Turn off the stove.Let this mixture cool to the room temperature.This process can be done in advance.I generally prepare double the quantity and refrigerate some portion for later use. Whisk the sour curds with 1/3 cup water,turmeric powder and salt.Add chopped coriander,grated carrot to the rava-oats mixture and mix it well.Let it sit for 10 mins. Check the consistency of batter,it should be slightly thicker than the normal idly batter and if necessary add a couple of spoonfuls of water or sour curd(if the mixture is dry) to get the consistency. In a ladle mix soda bicarb with a spoonful of water or if using eno add directly and mix with the mixture thoroughly. Meanwhile grease idli plate with oil/ghee and place the roasted cashew nut halves in the center with the smooth surface facing downwards and pour 3 tbsp batter in each impression and steam for 12-15 mins.If you are using cooker do not forget to remove the whistle. once you switch off the flame let it sit for 5 mins and then remove the idlis neatly with a wet flat idli spoon. Serve them hot with ghee,potato saagu or coconut chutney. *You can increase the oats up to 3/4 - 1 cup(of oats powder) for 1/2 cup rava,accordingly you need to increase curd+water to get the desired consistency of the batter. In general I mix in equal proportions as I like the texture better. I highly recommend to use eno instead of cooking soda for the fluffiest idlis. 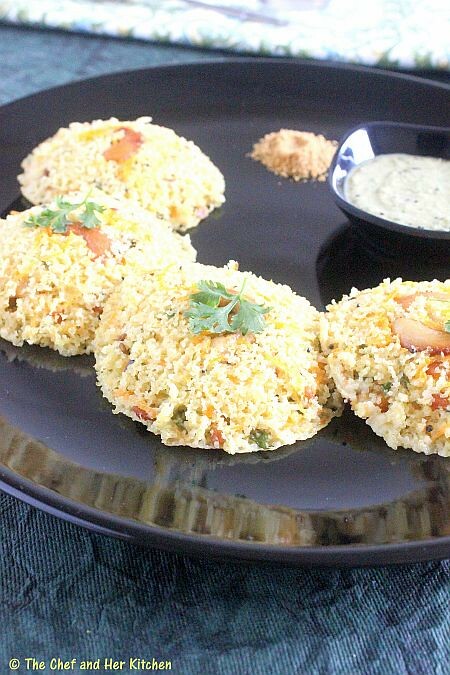 Normally sooji rava(upma rava) is used for rava idli,how ever if you want a healthier variation you can make it with finer variety of wheat rava(godhuma rava). If the curd is sour you get a nice tang to idlis.If the curd is not sour you can add 1/4 tsp of citric acid crystals to the curd and beat well. 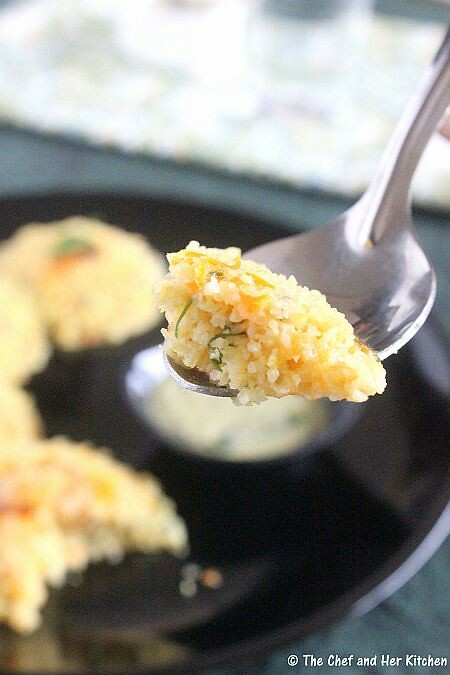 The color of oats idli might not be appetizing like a white rava idli,they turn slightly brown and hence I add a pinch of turmeric to this oats idli.However it is optional. I usually make double the quantity of oats-rava mixture and I refrigerate half portion of it for my later use,it stays good for a month if refrigerated.If I have this mixture handy I can make idlis in just 15 mins. Look at the soft porous texture of Idli in the above photo.I could not do justice to Idli with that shot photo but could not stop posting it to show the porous interior of Idli. Prathy you have some amazing dosa/ idli varieties here...This particular recipe I have to try as you have tempted me badly.. 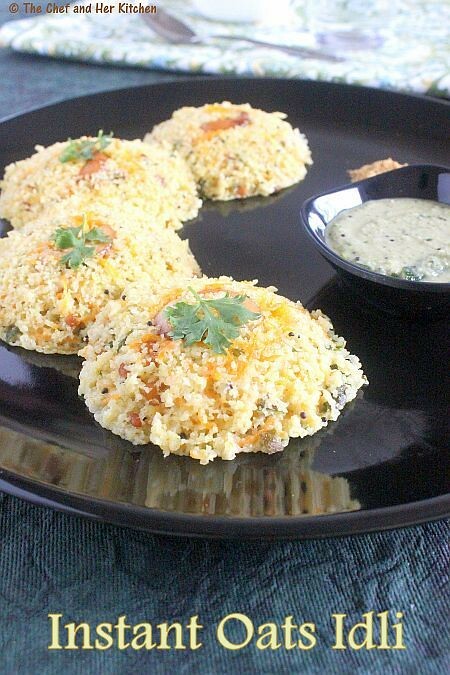 Delicious and healthy idlies.. They look so soft..
You've got it so perfect! Bookmarked right now. Looks very soft and tempting. Cant help but drool.. Idlis look super spongy n yum!!! Such a healthy and wholesome food, prefect for breakfast. Amazing recipe & a nice blog u have. I am defnitely gonna try this recipe & thx for sharing. 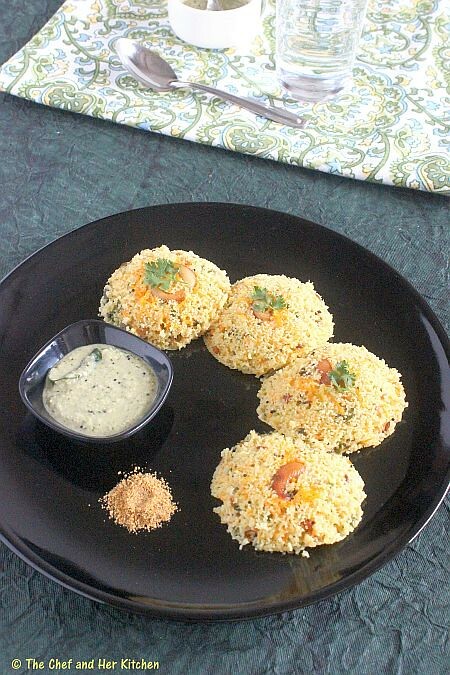 just made these, i was skeptical initially...but the idlis have come awesome and its healthy ! good pics. :-) i usually prepare oats upma. have never tried idli. your recipe looks interesting.will try it soon and let u knw how it turned out. We prepared these idlis last week.They were not as porous in texture as had been shown in the picture,nevertheless fairly soft as rava idlis.we have just pulsed the oats taking care they are not powdered. 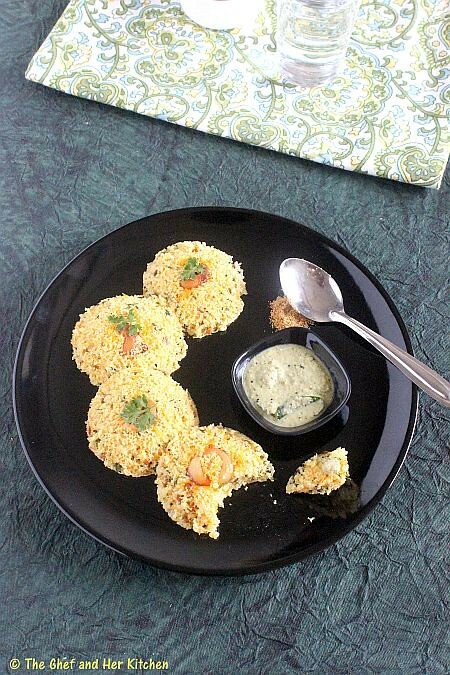 The idlis shown in the picture looks porous in texture,lead us to believe they are as soft as regular idlis. It just happened to click on this url and you don't believe i was going thru the recipes one after the other. Very good and interesting recipes. Thank you so much for sharing your recipes. @Kavitha..the addition of eno makes sure that it comes out nice and fluffy as it does in dhokla,there is no chance that it would become hard.Might be its a old one(eno)..also take care that you add eno at the end just before steaming..Do give a try again and follow the process carefully,I am sure that it would come out nice. These idlis were truly soft and porous . I liked the idea of adding eno fruit salt to rava idli...the texture was similar to that of dhokla. They tasted like the ones you get in the restaurants. Thank you. 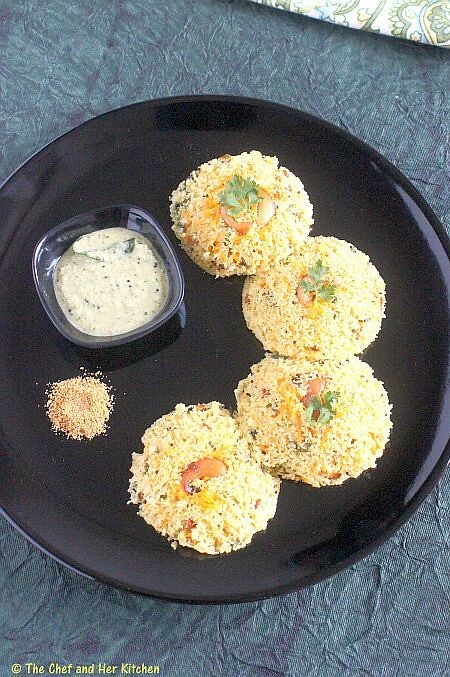 @Ashwini...Eno does the trick in these idlis...thanks for your feedbaack.